The contract includes planning and construction of the first photovoltaic system on a soccer stadium in Latin America. Gehrlicher Ecoluz Solar do Brazil will install a solar power system with power of 403 kWp on the roof of Pituaçu Stadium in Salvador da Bahia, the third largest city in Brazil. The project involves the use of two module technologies: On the one hand, flexible, very light-weight thin-film modules made by United Solar Ovonic (Uni-Solar) with total power of 238 kWp are installed on the canopy covering the grand stands. In addition, monocrystalline modules made by Yingli Solar capable of producing total power of 165 kWp are mounted onto the locker room and some parking lot roofs. 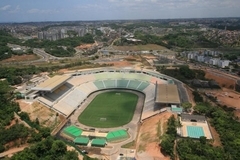 Financing for the system is supported by power producer Coelba and the government of the State of Bahia, the owner of Pituaçu Stadium. A portion of the green electricity generated is intended to be used for operating the stadium in the future and thereby reducing the running energy costs. Tender procedures for the twelve venues of the 2014 Soccer World Cup are still in progress. Gehrlicher Solar – Imagine the Energy :: Gehrlicher Ecoluz Solar do Brasil to build a solar power system on a soccer stadium in Brazil ::.